Ivoy showroom nests in the heart of the 6thborough of Paris, in a very charming and traditional apartment made of stones and beams. Come and discover Ivoy dream universe, be amazed by our collections, try all the costumes of your choice and, helped by our advices, choose the outfit that will make happy generations of children. We will also be able together to imagine the very special gown or prince costume that you dream about. We will guide you in the choice of the cut and fabrics for a unique and personalized result that you will receive a few weeks after. It is always a unique and unforgettable moment for children and parents that we meet. Ivoy Paris is a couture house defined by its unique know-how in designing children costumes. 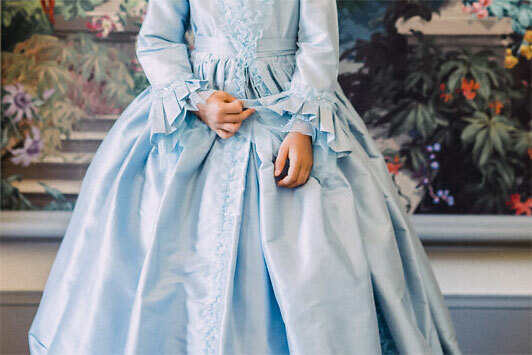 Rigorous attention to very smallest detail is paid when creating Ivoy princess dresses. Cuts are perfectly studied to enhance the waist and adjust to every type of morphology. All our costumes are hand-made by the atelier’s fairies. We master all haute-couture techniques: hand-rolled hemlines, embroideries, perfect cuts and finishing. The tulle underskirts are made slightly above the length of the lining in order to avoid any skin scratching or discomfort. All the luxurious materials such as Indian silks and cottons, Italian taffetas, French lace, Bohemian crystals are selected with care. Elisabeth, the designer chooses each year the most beautiful and resistant fabrics for your children. To create beauty, to create to last, to let dream, here is our credo for each collection.